I’ll try not to get too sappy with this introduction, but Tyler and I celebrated our second wedding anniversary this week. Everyone says this, but the two years since that boiling hot evening next to the river in Lodi, California, have truly flown by. We still consider ourselves newlyweds in so many ways. You know when people talk about their baby, and they are like “Oh my gosh, twelve/sixteen/twenty-four months already?!? Stop growing, please!!! !” That’s how I feel about our marriage. I know that this time we have together, just us, is so precious and temporary. I want to stretch each day out as long as I can and savor each moment with him in this phase of life. In honor of our anniversary, we wanted to talk about our honeymoon that we took right after our wedding: two weeks backpacking around Italy. I actually wrote most of this when we first started toying with the idea of a travel blog, over a year ago. I wanted to see what it would look like to go back through our itinerary and sort out what we would recommend to someone planning a similar trip. Today, we are discussing the happiest place on earth: the Amalfi Coast. We spent the first week of our marriage and our honeymoon in Amalfi, and it will always hold such a special place in our hearts. We’ll go over a few logistics and transportation to and from Amalfi because it is a little complicated and kind of a pain. We’ll also walk through each town we spent time in and what we recommend. But first. Why backpack through Italy on a honeymoon? Two weeks spent living out of a Patagonia duffel backpack and getting around on Italian public transit might not sound like the rejuvenating getaway some folks have in mind when they start planning their dream honeymoon. But for us, it was perfect. We completely understand the draw of an all-inclusive beach resort as a honeymoon destination. Wedding planning can be just a **tiny** bit stressful for most people, so the idea of lounging in a cabana with a Mai Tai in hand makes a lot of sense. This may come as a shock, but Tyler and I aren’t the greatest at relaxing. Sure, I love to clock in some pool time (no more than an hour and never without SPF 30– there’s no way you all thought this tan was natural), but we both get antsy if we aren’t on the move. We decided that we wanted to do something a little bit more adventurous for our honeymoon and first big trip together. And plain and simple, Italy is the best. The people are vibrant and welcoming, the food is incredible, and the atmosphere is addicting. We are obsessed. The cost of a honeymoon spent backpacking through Italy compared to a week at an all-inclusive resort ended up being way less than we originally thought. We stayed in relatively inexpensive Airbnb’s ($60-100 a night) to save money for fun dinners, drinks, and activities (gelato). We spent the most money on the flights: $1200 each, round trip. We definitely could have found cheaper, but we were unable to be flexible with our dates. We also flew home from Venice which was much pricier than a round trip from Rome would have been. We spent six nights on the Amalfi Coast, two nights in Rome, and three nights in Venice. We’ll talk about Rome and Venice later, but the Amalfi Coast was stunningly beautiful. It is by the far the most romantic place we’ve ever been. Tyler and I flew from SFO to Rome and then took a train from Rome to Naples. We arranged for a private car to take us from Naples to Positano. The traffic from Naples out to the coast was horrendous, and it took over three (very car-sick) hours to get to our Airbnb. That meant that from the time we landed in Rome, it took six hours to get to Positano. If we did it again, we’d definitely fly into Naples and hop on the local train to get down to the coast. Wondering how to get to Rome from Amalfi? Again, don’t do what we did. We didn’t think it through and decided to waste our last day in Amalfi traveling by bus down to the less than impressive city of Salerno. We spent a night in a tiny B&B there and hopped on the early train the next morning to Rome. The only advantage of this was that we started our day in Rome bright and early. However, it wasn’t worth wasting the entire previous day on public transport only to end up in sticky and crowded Salerno for the evening. We suggest enjoying every second you possibly can in Amalfi. Take a slightly later train from Salerno to Rome (and grab the earliest bus to Salerno). OR, splurge on a private car to take you to Naples where you can easily jump on a train to Rome. Positano is the ideal base for exploring all this stretch of coast has to offer. We went in August which happens to be the month that every Italian and their mother (and mother’s mother) close up shop and head to the Amalfi Coast for a holiday. I will also note now that Amalfi has grown immensely popular and is notably more expensive than most other areas in Italy. Crowds and cash aside, this town is stupidly picturesque and surprisingly gorgeous at every turn. Do. Not. Skip. It. We stayed in an Airbnb apartment in Montepertuso, a tiny village on the hill above Positano. We loved our spot on the hill because we were able to get away from the tourist-infested pathways of Positano at night. The downside of staying in Montepertuso is that you either have to make the 20 minute trek by foot (hello, nature’s Level 10 Stair-climber) or rely on the town bus system to get to and from Positano. Transportation reliability is pretty much what you’d expect from this sleepy area, but who can hold it against them? A herd of New Yorkers on the bus (who were almost too intimidating to not trust) recommended we eat at Il Ritrovo. Even if you don’t end up staying in Montepertuso, we still recommend the trip up the hill to dine here. The service, prosecco, and gnocchi were to die for. The next day, we rented a boat and explored the coast. I know I throw out hyperboles a lot on this website, but this day was honestly one of favorite days EVER. We cannot recommend this experience enough. It is extremely simple to rent a boat from the beach in Positano. It costs about 100 € to rent the 8 horse power boat for four hours, and it is well worth every euro. We took the boat down the coast and explored a couple of beaches and coves along the way. The water in August, by the way, is the perfect temperature. We packed cheese, bread, and mimosa supplies, of course. We stopped to have lunch (yes, lunch) on our own private tiny beach. We started our night out that evening at the Champagne & Oyster Bar at Le Sirenuse. Unless you are honeymooning with the Prince of Wales, we recommend just stopping in for a bellini and the free olives at this luxurious hotel. The stunning views, carefully concocted drinks, and romantic live music make this the most magical happy hour you’ll ever experience. Bellini buzz in tact, we sauntered across town to Ristorante Mediterraneo, recommended by our Airbnb host. Amalfi’s specialty is seafood, and this place did not disappoint in that arena. Even if for some wild reason you don’t enjoy a good seafood risotto, the guitar-playing Italian man will be there to distract you. And if that isn’t enough, take a shot of limoncello to wash it down. (If you’ve done even five minutes of research, you know now that the Amalfi Coast is famous for its ginormous lemons. Limoncello is a traditional liqueur produced in Southern Italy with said citrus and tastes like 46 lemons squeezed into a glass of vodka). After dinner, we went way too early to the only club in Positano named…wait for it…Music on the Rocks. Because it was only 10pm (can we pull the honeymoon card here? ), the host suggested we go up to the rooftop bar until things started picking up on the dance floor. Even if you aren’t in the mood to go clubbing (spoiler alert: we walked home at 11pm), we highly recommend stopping in at the rooftop bar here. It is RIGHT on the water and the bartender gave us a dessert sampler plate on the house. On our last day in Positano, we took a trip to the island of Capri. We wanted to mention Capri in the post because it is truly a beautiful island with lots of shopping and fun restaurants. However, Capri was our least favorite spot on the Amalfi Coast. It was WAY more crowded than Positano, and it just felt very touristy. We did love the company that we went with, though, so we wanted to also link them here. We took a boat tour to the island, along with about eight other passengers. Our captain was awesome and stopped along the way and let us jump out and swim. If you do need to go to Capri, definitely use Viator. Also, take the chairlift from the town of Anacapri up to Monte Solaro for an incredible view of the entire coast. After three days in Positano, we jumped on a local bus (Sita buses “Positano – Amalfi” line) and tried not to get carsick on the curvy 20 minute ride to Praiano. Praiano is the next town over from Positano and is much less crowded and more peaceful. We spent 3 days relaxing and enjoying the less hectic side of the Amalfi Coast. On our first day, we had some time to kill before we could check in, so we lugged our backpacks down to the beach. You can find La Gavitella by following the signs from Piazza San Gennaro. On this walk we just so happened to stumble upon a bar that this genius Italian started on his rooftop. It’s called Cafe Mirante and if you are even remotely near Praiano at any point in your life, you MUST go. This spot has the most amazing view in Praiano. The bartender/owner/greatest man you’ll ever meet makes the most refreshing limoncello cocktail. At the beach at La Gavitella, you can rent a chair for a couple bucks and enjoy the peaceful views. It’s a little crowded but nowhere near the mayhem on Positano’s beach. We swam here for a few hours. We stayed three nights in an Airbnb on the top of the hill. It literally took about 20 minutes of vertical stair climbing to get from the bus stop and town square to our apartment. But at this point in our trip, we could stand to burn the extra calories. The one complaint we had about this Airbnb, besides the stairs that we should have been thankful for, was that the porch outside of our room was completely infested with mosquitos. The view was breathtaking, but we weren’t able to fully enjoy it (especially during and after sunset) because we would get eaten alive by bugs. (I think I left Italy with 17 bites). Note: this is likely a seasonal problem, so I doubt that it would be an issue outside of August. Our host recommended that we eat at Kasai, but we didn’t make a reservation and had to wait for two hours. Luckily, they have a bottle of champagne outside for starving fools who lack the forethought to call ahead. The pizza was heavenly and well worth the wait. Don’t order the croquettas, though. Those are meant to be consumed in Spain and Spain only. Our second day staying in Praiano, we ventured up to the magical town of Ravello. 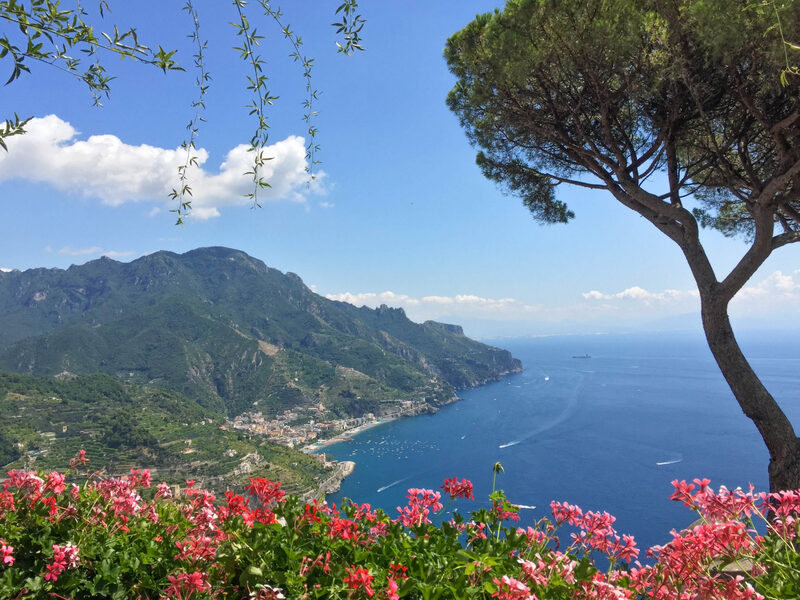 To get to Ravello, take the Sita bus to Amalfi town and then hop on a bus up to Ravello. We spent a couple extra euro to take one of those bright red audio tour buses in an effort to learn a little more about the area. The second we stepped off the bus in Ravello, we fell in love. Ravello is a peaceful little town in the mountains that looks down at the Amalfi Coast. We loved exploring all of the perfect little alleyways. It seemed like each corner we turned brought us to a view more stunning than the last. We had spent a couple of hours walking around the town when we came across a little wine cellar entitled “Wine and Drugs.” A mysterious Italian woman came outside and asked if we wanted to do a free tasting. We tried to set the expectation that shipping a one hundred dollar bottle home was not in our budget for the trip, but she insisted. I mean, who are we to turn down a free tasting of some of the finest wines in the world?? After an aggressive round of wine tasting, we just so happened to stumble upon the Palazzo Sasso (now the Palazzo Avino), a recommendation from our favorite show at the time, White Collar. We embraced our inner Neal Caffrey and snuck down to the deck by the spa. The view was breathtaking and we were in heaven. Once we got kicked out of the spa deck, we went up to the bar and ordered the fanciest, most expensive drinks we’ve ever purchased. I ordered “The Marilyn” without hesitation. Twenty minutes later, not one but two servers walked out to us–one with the cocktail in hand and the other holding a bottle of Chanel No. 5. The server with the perfume gave the flower on top of the cocktail an emphatic spritz with a nod. The other server plopped the drink on the table in front of me while we picked our jaws off the floor. That afternoon was one of favorites of the entire trip. We always say the Palazzo Avino is where we’d go if we ever needed to get out of Dodge (and if we also happened to strike gold at our apartment in Los Gatos). That night, we had a fabulous dinner at Da Salvatore to wrap up our time in the Amalfi Coast. All this reminiscing is making me emotional and also hungry. We have been to a ton of really amazing places together, but it’s really tough to beat that magical week on the Amalfi Coast. We’d go back in a heartbeat. Thank you!! That means so much. I hope you get to Italy soon!!!! Hey! I don’t see any info on how you went from the Amalfi Coast to Rome/ Venice! Do you mind sharing a bit about that with me? My husband and I are planning a trip and we aren’t sure how to fit everything into our very limited 9 days but we wanted to figure out how to include the coast as part of the time. How much time did it take to get from the coast to Venice? Or what would you recommend? Hi Whitney!! You two are going to have the best time!! I am posting a full breakdown of Venice and Rome very soon. I’ll elaborate on this more then, but I personally did not love Venice. If I had 9 days in Italy, I’d spend them in Rome, Florence, and on the coast (to be exact- I’d do 2 days in Rome, 2-3 in Florence, and the rest on the coast- either in Amalfi or Cinque Terre). Cinque Terre is further north and may be easier for you all to get to. However, if you can spare 3-4 days out of your itinerary, I would make the trek down to Amalfi. Rome is central to all of this, though. For example, you’d have to go through Rome to get to Venice, Florence, Amalfi, etc. The easiest way to get down to Amalfi is through Naples (Rome-> Naples -> Positano, etc). The train from Rome to Venice takes almost 4 hours and just over an hour to get to Florence. I hope this helps!! Please email me at ruth@romebythehour.com if you’d like!